FILE PHOTO: Faith leaders place their hands on the shoulders of U.S. President Donald Trump as he takes part in a prayer for those affected by Hurricane Harvey in the Oval Office of the White House in Washington, U.S., September 1, 2017. 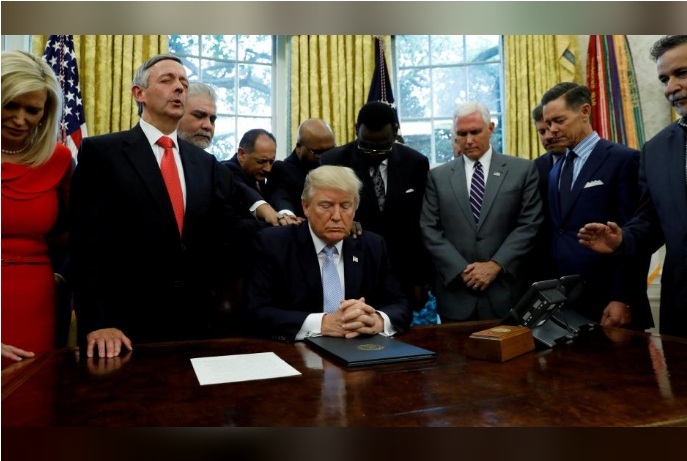 WASHINGTON - As President Donald Trump bowed his head in the Oval Office earlier this month, Texas Southern Baptist Pastor Robert Jeffress and other U.S. religious leaders laid their hands on Trump’s back and prayed for Hurricane Harvey’s victims. With TV cameras and reporters watching, the scene was a powerful reminder of one of Trump’s most reliable and improbable political assets - his close ties with conservative Christians. A new Reuters/Ipsos poll shows, however, that Trump’s popularity among white evangelicals has weakened, suggesting his grassroots support may not be as unconditional as religious leaders’ public displays of allegiance would suggest. That may pose a problem for Trump and his allies as the 2018 midterm congressional election season nears. Trump’s strong links to conservative Christians played a key part in his stunning victory in the 2016 presidential election. Though disenchanted evangelicals were unlikely to switch their votes to Democrats, they could stay home next year when U.S. voters elect senators and representatives. “When your base is starting to even slowly move away from you, that should be a sign of concern,” said Justin Vaughn, director of the Center for Idaho History and Politics at Boise State University in Idaho, a state Trump won handily last year. In a country that is more religious than most other western democracies and where a president’s spiritual life is closely examined, the twice-divorced New York billionaire socialite, who has attended church just twice since his Jan. 20 inauguration, is an unlikely torchbearer for conservative Christians. He has labored to build and preserve this unlikely alliance, embracing social issues, such as commitment to anti-abortion and religious liberty policies, and picking staunch conservative Neil Gorsuch, for the Supreme Court. Trump also mentions God far more often in public remarks than his two predecessors, a Reuters review showed. But data from the nationwide online Reuters/Ipsos poll conducted from Jan. 22 to Aug. 25 suggest Trump has been unable to prevent his evangelical support from sliding in line with his overall ratings. The majority of those polled last month who described themselves as both “white” and a “born-again or evangelical Christian” said they approved of Trump, but considerably fewer than when he took office almost eight months ago. The White House did not respond to requests for comment on the poll. That is a drop from the first four weeks of Trump’s presidency, from late January to mid February, when 73 percent of white evangelicals said they approved of his performance while 23 percent disapproved and 5 percent had mixed feelings. The poll was divided into eight four-week periods, with each including about 2,000 people and a credibility interval, a measure of accuracy, of about 2 percentage points. The declines are broadly in line with those recorded among all adult Americans. In interviews, 10 of the surveyed conservative Christians said they were not concerned about Trump’s religion. Rather, they questioned whether he was doing enough to help average Americans and the frequent chaos in the White House. “We can’t go a week without someone leaving his administration. There is no stability in our government,” said Robert Waldram, a 52-year-old Baptist churchgoer from Williamsburg, Virginia, in a telephone interview. In his first 200 days in office, Trump mentioned God about 100 times in public remarks, excluding the standard “God bless America” that presidents routinely end speeches with, something his ardent supporters welcome as readiness to eschew political correctness. By this point in their presidencies, Democrat Barack Obama had mentioned God 43 times, while Republican George W. Bush had referred to God in 60 instances. Jeffress, one of the first prominent evangelical pastors to back Trump for president, said his God talk was apolitical. “I understand that cynical people would say this is just for political expediency, but ... I believe this comes out of some deep beliefs that he has personally,” Jeffress said. Trump, who describes himself as Presbyterian, was not known to be an avid churchgoer before becoming president and critics have said his blunders on basic biblical knowledge, harsh attacks on political adversaries, and his demeaning comments about women clash with Christian principles. “He, himself, doesn’t have the most sterling track record in terms of either church attendance or professed or displayed knowledge of scripture,” Gary Scott Smith, a historian and author of “Religion in the Oval Office: The Religious Lives of American Presidents,” said of Trump. The pastors involved with Trump’s evangelical advisory board describe him, though, as very inquisitive about faith and more thoughtful on religion than he might appear in public and conservative pastors have continued to support him through various firestorms. Evangelicals have had “unprecedented” White House access in this administration, said Richard Land, a board member and president of the Southern Evangelical Seminary, a Christian college. After Trump’s response to violence between white nationalists and left-wing protesters in Charlottesville, Virginia, led to two of his business advisory councils disbanding, there were questions about the evangelical board’s future. Brooklyn, New York, megachurch pastor A.R. Bernard resigned, but others remained, saying it was their job to provide advice and counsel to Trump, even when they disagree with him, and to press the president on Christian issues. As President Donald Trump bowed his head in the Oval Office earlier this month, Texas Southern Baptist Pastor Robert Jeffress and other U.S. religious leaders laid their hands on Trump’s back and prayed for Hurricane Harvey’s victims.